Our 5/8" engraved dice are available in low qtys and a wide variety of colors. Min. order is 50 for these 2" Jumbo Dice. We can imprint around the #1 dot and in between the #2 dots. Sizes range from 5/8" up to 1". Min. qty's change per size. Most min. orders for the imprinted dice start at 500. 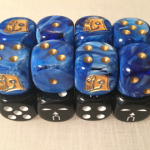 We have the ability to customize several different types of dice. We also carry different dice sizes from 5/8" to 1" dice and in some cases are able to produce 2" Jumbo dice. With our 5/8" dice we are able to engrave all 6 sides or just one side whichever you prefer. Our engraved Custom Dice can be made in qty's as low as 5 pair or 10 dice. We have several dice colors available, so please contact us with your project needs and we will be sure to send pictures. Please contact us for pricing on custom engraved dice. If you are looking for imprinted dice pricing and pictures, please visit personalizeddice.com. The way your artwork is designed will depend on the style of dice you are looking for. With engraved dice we will need either a logo or line art. Our imprinted dice have a higher capability of various colors and pictures. Pricing depends on the qty and size of dice needed. Please contact us with your requirements and we will respond quickly with a quote for you.